Dolly is a Zaccoyo daughter. In 2014 she had TnC Genesis's Spirit of the West out of our herdsire TnC Genesis Next Generation. Dolly is an easy keeper and an excellent mom, keeping her cria well fed with lots of growth. Dolly is bred to Genesis for a 2019 cria, the last time we did this the result was outstanding so we thought we would try again. Foo has some awesome fleece characteristics with amazing staple length but his coloring precludes him from being used as a stud on our farm. He has been sold as a fibre male. 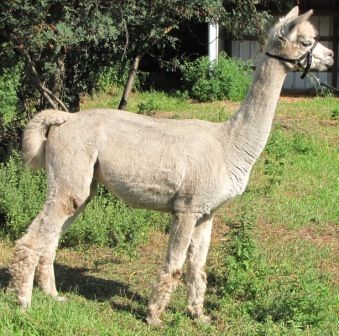 ​Spirit has been sold as a herd sire to Ariya Alpacas in Quebec. ​Jimmy, as we affectionately call him is for a sale as a herdsire prospect. He is a light fawn.